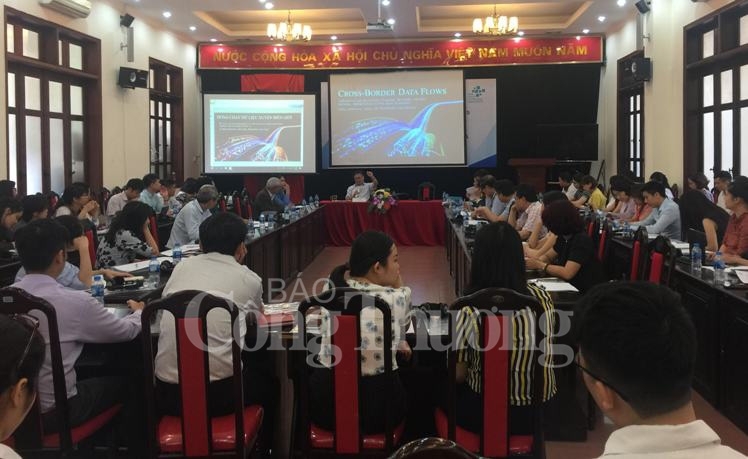 A workshop on Cross-border Data Flows took place in Hanoi on May 3 to discuss the importance of data access and sharing and the need to develop a legal framework on data management to boost the growth of digital economy. The event was co-held by the Central Institute for Economic Management (CIEM) and the Asia Cloud Computing Association (ACCA). Delegates talked about the prospects of Vietnam’s economy in the fourth Industrial Revolution (Industry 4.0) and the development of digital platforms for e-commerce, e-services and infrastructure for cyber-security. They also outlined Vietnam’s opportunities and challenges in effectively forming a management system of new digital tools in business. Speaking at the event, ACCA Executive Director Lim May Ann announced a report on “Cross-Border Data Flows: A Review of the Regulatory Enablers, Blockers, and Key Sectoral Opportunities in Five Asian Economies: India, Indonesia, Japan, the Philippines and Vietnam.” The report provides an overview of the current policies on data management in these nations and their impacts on the economic growth at large and the development of small- and medium-size enterprises. It takes an investigative look at the way the five Asian economies are aggressively transitioning to more digitally enabled economies. While there are similarities in the drivers of these transitions, there are also significant differences in the approaches being adopted. The Philippines, for example, has no explicit “digital economy” policy, whereas India has become “Digital India” and Japan is striving to be the “World’s Most Advanced IT Nation.” Conversely, the Philippines has no explicit cross-border data flow restrictions and was the first Southeast Asian country to formally adopt a “Cloud First” approach. Vietnam today is among countries with high numbers of Internet users, estimated to account for over 50 percent of the population; and the Internet access rates in the country are on a par with others in the region, said former Standing Deputy Minister of Post and Telecommunications Mai Liem Truc. These have significant impacts on the country’s digital economy, he noted. According to the ACCA, Vietnam holds huge potentials to expand the digital economy but the country’s legal environment for cross-border data flows is not as open as compared to other four nations. The ACCA cited a number of provisions of the Law on Network Information and Security, which require cooperation with the government and facilitate State agencies in carrying out “technical measures” when necessary, which imply allowing the Government to access encrypted information that could undermine users and personal privacy in Vietnam. Secondly, Decree 72/2013/ND-CP on Management, Provision and Use of Internet Services and Online Information requires IT companies to establish at least one server inside the country to “serve the inspection, storage, and provision of information at the request of competent state management agencies”. At the same time, Circular No.38/2016/TT-BTTTT, one of the documents guiding the implementation of Decree 72, also contains detailed regulations on the cross-border provision of public information. Certain providers of such content are required to implement content restrictions related to national and social security. Thirdly, the country has got tougher on taxation of the digital economy with stricter regulations for taxing income derived from Vietnam by digital companies from social media, accommodation and ride sharing sectors. Lim May Ann suggested that the Government of Vietnam should adopt a more cautious approach to ensure that building a safe cyber environment does not inadvertently restrict and hamper the potential of the digital economy and the entire economy at large.